I connect communities. How can I help you? I'm Mike, a community advocate, social media strategist, digitial media innovator, community collaborator, professional communicator, father of four and husband to an amazing woman. I've worked in communities in BC and Alberta engaging residents in community-driven solutions to complicated problems. Using social media, digital resources, engagement strategies, and lots of coffee, our innovative solutions have been replicated and studied across North America. From #VicPDHelps, Canada's first twitter crime reporting to the first Canadian interactive police app 'mobileVicPD' and using Pinterest to return recovered stolen property, innovation and collaboration are key tenets of our work. I am an advocate of online security and privacy and have trained and presented on open source investigations, internet security and the implications of information sharing in our digital environment. The successful parterships I develop, lead to great collaborations between community, police, government, social agencies and the business community, with the end goal of creating a caring, safe community for all. I am a passionate volunteer and advocate, having volunteered thousands of hours with charities throughout Edmonton and Victoria and am passionate about giving back to the communities I love. Nice to meet you, how can I help? I have worked in various communities in Alberta and BC and have always found my most memorable positions were working directly with the community. No matter where I have gone in my career, I gain strength from the dedicated and amazing people who have the drive and determination to make their communities a welcoming place to live, work, and play. I am often asked to speak at community events or help develop social media strategies, policies or engagement sessions. I am honoured to be able to share my expertise and lessons learned with our communties. I was honoured that a member of my community recommended me to be interviewed by Tim Burrows of The Police Podcast. Thank you Tim for the opportunity to discuss my thoughts on modern-day policing. I often refer to my Idea Wave 2011 attendance as the moment my brain got wrapped around the 'social' part of social media. I had attended by request of the organizer Kris Constable (@cqwww) and presented on community policing and how we could, and needed to, change. Janis Lacouvee (@Lacouvee) was also an invited speaker and presented on how social media was this times' 'front porch'. If you've every read my twitter profile, it reads that I am a 'believer that the removal of front porches is leading to the decline of modern society'. It's no understatement that Janis' talk struck a chord. I traded in my flip phone for my first iPhone, logged in to twitter for the first time, and the rest is history. I was asked to co-present during Social Media Camp in 2012 with the now mayor of Victoria Lisa Helps (@lisahelps). Part of my Social Media Camp experience in 2012 was being asked to come in and participate in a #yyjChat, one of the first of many for VicPD. Thanks to Mat Wright (@matvic) and Susan Jones (@SusanJones) for help in setting this up! In 2014, during my attendance at Social Media Camp, I was interviewed on the John Paul & Mic show talking about my management of VicPD's social media. Advocacy is an important part of our communities. In 2014 I presented to the BC Cycling Coalition on using social media for advocacy, specifically how non-profit organizations with volunteer run social media managers can really make an impact. I'm an advocate for internet security and online privacy. Not only am I passionate about the topic, I've trained in security tactics and open source intelligence gathering. Because of this I was invited as a guest lecturer to FIN Talks for the Government of BC's Ministry of Finance. It was awesome to look up to a sea of phones as folks were following along, securing inforation and giving thoughts to what is shared online. 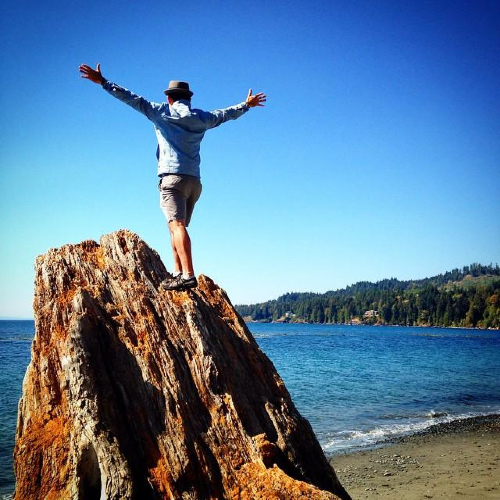 Being the VicPD Social Media Officer and Media Spokesperon has allowed me to solidify VicPD as leader in the use of social media to connect with the citizens of Victoria and Esquimalt (and many others). My position has allowed me to develop and implement numerous community-driven initiatives using social media, digital resources, traditional media and face-to-face engagement techniques. These initiatives have been designed to empower my organization, fellow community members and colleagues. My goal as the Social Media Officer and Media Spokesperson is to allow conversations to flow freely between my organization and the community, and to teach my organization how to be 'human'. I have been an invited guest lecturer at twenty seperate events and taught at every level, from classrooms full of highschool students to ballrooms full of Canadian Chiefs of Police and graduate-level university courses. "A three-person talk about marketing compassion in Victoria offered some unique insights into the world of non-profits. 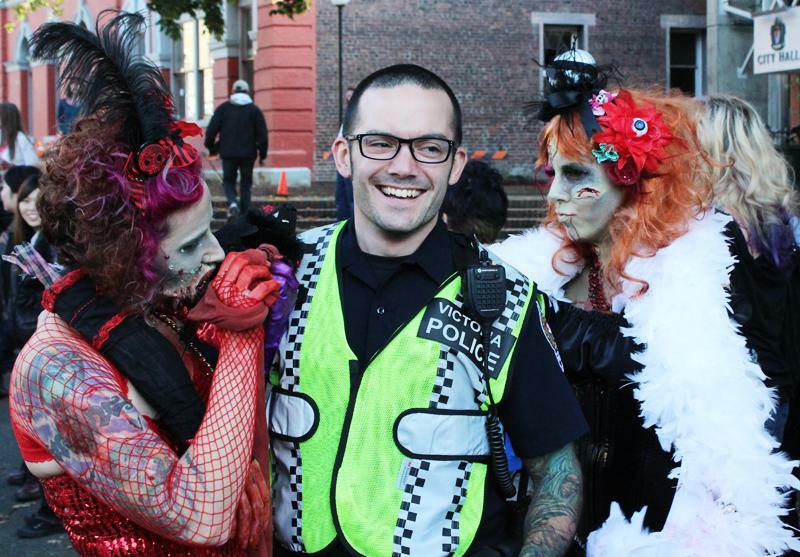 The Victoria PD’s newest Twitter star, Cst. Mike Russell, “stole the show” according to one participant, with his social media insights." "After the first hour and a half of our scheduled three hour presentation, our team collectively realized that we were only scratching the surface of the knowledge that Mike and Bowen had to share. We abandoned the remainder of our training agenda for the day and Mike and Bowen stayed with us providing both familiarization and insight in to social media as it relates to investigations and negotiations." Due to high-profile events in Canada and North America, an active online conversation around sexualized and domestic violence was happening. Although my organization did not face criticism for these events I saw a fantastic opportunity to reach out to survivors of sexualized and domestic violence with an offer of support. I wrote 'We Beleive You' to be a compassionate, caring, but factual piece that would let survivors know that we are dedicated to their well-being. VicPD has been a guest on our local #YYJChat three times. After a recent 7.7 magnitude earthquake off the shores of Vancouver Island, VicPD was asked back with @SaanichPolice. This was one of the busiest chats and resulted in 1.1 million impressions and a fantastic hour. VicPD is now a Reddit user as we have a fairly active sub-reddit here in Victoria and it has been hugely successful. We had a huge launch into this platform on November 8, 2012, creating a front page worthy entry that all started with one word: cough. VicPD was the first police department in Canada to use Reddit for an AM(a)A (Ask Me *almost* Anything). This was a two hour, intensive, Q and A on the /r/VictoriaBC subreddit. VicPD is active on numerous social channels and our reach into the community helps to build strong conversations and great partnerships. Each channel is selected for what it brings to the community and how it can enhance our offerings to the communtiy. In 2014, VicPD welcomed a new Chief Constable. Our team in VicPD's Public Affairs section set out to engage the public in meaningful conversations that would help bring us together as a community and help the citizens understand their police department. Three successful 'world-cafe' style events were held with hundreds of people reached in person and through parallel online engagements. This information was coupled with the results from the 2014 VicPD Community and Business Survey and reported back to the community through in-person community and business presentations, hard-copy handouts and digital engagement. VicPD has long been recognized as a leader in technology and it's creative use to connect with the community. On Canada Day 2012, VicPD became the first Police Department in Canada to accept calls for service via Twitter. Social Media engagement in the news. My work with VicPD has been recognized across North America for my innovative communication and engagement practices. I have led VicPD to be the first Canadian police department to develop an interactive app, the first to take calls for service on Twitter during large-scale events, and solidified a long-lasting community partnership with UsedVictoria.com while using Pinterest to return lost or stolen property to the rightful owners. Innovation and service to my community is at the core of everything I do. In 2012 I was part of a select group of community members, VicPD officers, civilian staff, and Police Board members who came together to draft a new vision for VicPD. Out of those strategic meetings was born StratPlan2020, an innovative strategic plan that would chart the course of the organization until 2020. I was tasked with marketing the new plan. Our office created an unconventional, image driven booklet and complemented it with a professionally developed video by MediaOne Multimedia. All of this was supported by a large-scale social media promotional campaign. The media launch was a huge success and the strategic plan garnered two days of traditional media coverage and great community conversations online. The campaign for StratPlan2020 was nominated for, and won, the Victoria Chamber of Commerce Innovation Award in 2012. The Chamber Innovation Award is Sponsored by the University of Victoria Peter Gustavson School of Business. 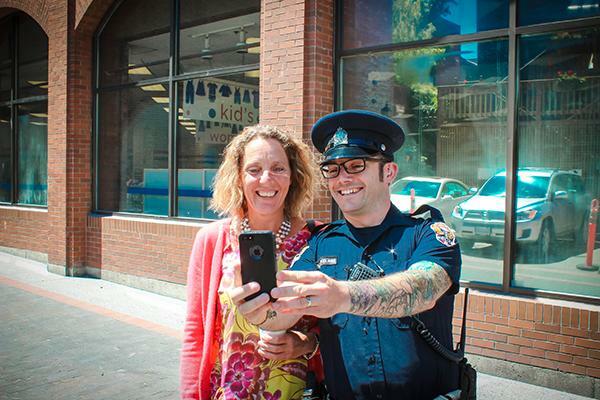 In 2013 VicPD partnered with MobilePD to create Canada's first interactive police app. We now have the ability to use the mobile app to instantly send out alerts on missing people, large-scale police events, ongoing investigations and a myriad of other things. In one year, mobileVicPD surpassed our goal of 10% uptake from eligible Victoria and Esquimalt residents. Although we have over 11,000 downloads, we were experiencing successes from day one. The development, marketing and use of this app was responsible for the locating of missing seniors and providing photos and information, through push notifications, instantly. After the earthquake in Christchurch, New Zeland I watched as the local, national and international community came forward to help. A large part of that helpful push came from social media users around the world. As the days unfolded, there were a few hashtags that were being used to bring the community together. Members around the areas were using hastags that had 'has' and 'needs' so they could link up those that had supplies with those that need. That was the impetus for #VicPDHelps. I wanted our agency and community to start to have that in the back of their minds if we encountered a large-scale disaster. On Canada Day 2012 we launched #VicPDHelps and became the first Police Department in Canada to accept calls for service via Twitter. I had joined reddit as yet another great way to connect with an online community whose members were looking for information, but didn't use, or interact, with many of the other traditional streams we were already participating in. After only a week, while I was still learning the platform from moderators and other users, I had success with it. On November 8th, 2012, a post went up on the local /r/VictoriaBC subreddit titled, 'Ways to Buy Weed at UVic'. Quite innocently, and intending to add some personality and humour, I answered the ad as VicPDCanada with a simple 'cough' comment. This small, funny, introduction to our reddit community led to a two day conversation about drug policy and safety and we had opportunity to explain, in detail, why we did, or didn't take certain actions. The comment garnered a lot of attention and the post was seen on the front page. In other words, our understanding, rational conversation was seen by 8 - 10 million people that day. What a fantastic way to show our humanity. The novelty of having VicPD as part of the local reddit community didn't die off and we were soon contacted to do an 'Ask Me (almost) Anything'. Again, it was a fantastic way to have a weeks-long dialogue with some awesome folks. From funny to fantastical, the questions definitely made me think. Having a direct effect on your fellow community members' well-being is a fantastic thing. In 2012 I led a new project to make VicPD the first police agency in North America to use Pinterest to return stolen property with the rightful owners. If an officer couldn't track down an owner by traditional means, I would post a picture of the item on our Pinterest board 'Is This Yours?'. We had some limited success, returning a handful of items. Residents loved this interaction and sharing though, and our lost property was some of our best shared social media. In 2014 Pinterest changed some of their rules, and if you were not a member, you couldn't see the items posted. Noticing a barrier to our program, I started to look around for alternatives. UsedVictoria.com contacted me around the same time and offered to help set up a great, searchable, free and open way to place items. #IsThisYours on UsedVictoria.com was born. Since that time, our return rate has increased tenfold and our great community partnership has paid dividends.